If you noticed problems with community portal integration please check if your Pottery app is one of the applications that is authorized to access your Facebook. 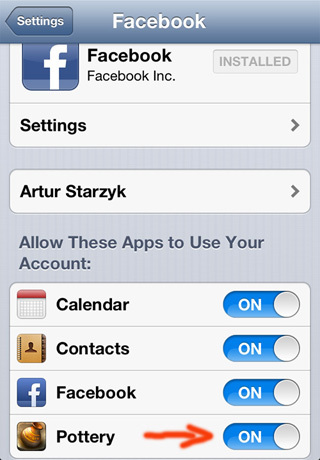 Simply check Facebook settings in the general settings on the device. Screen below shows proper approval. If this still doesn’t work. You have to delete your Facebook account and add it again. Before you delete the account, make sure to shut down the Pottery app. 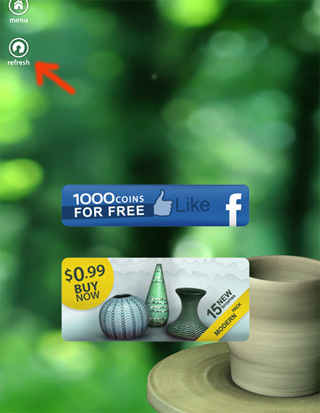 Double press the home button and then press and hold the pottery game icon – use red minus to turn off the application. Now add your Facebook account again and run the game. Due to several Android versions and different configurations on each phone we are unable to provide exact walkthrough. Basically make sure that your Facebook account (used in the official FB app) is the same you are using in the Pottery app. If not, please delete the Facebook app and install it again with the proper account. Then once you launch Pottery it will ask for a permission to connect with Facebook. If you agree then it should work. Additionally you can log out and log in once again inside the Pottery app. Use “switch user” icon to finalize this process. After that “facebook error” should disappear. How to retrieve my premium brushes after app re-install or on the new device? To have access to all premium pack brushes you need to finish first 11 quests. Then you will be able to visit Premium Store (check the new icon on the main menu) and use the “refresh” icon to retrieve all purchased previously packs. Please notice, that for retrieving you’ll need the same account used to purchase the packs in the past. Apple or Google doesn’t allow to move the content from one account to another. 2. Please make sure your OS version is the newest that you can get for your device. 3. You can also try to delete the game from the device and install it again. However be aware that you will lost your game progress (coins, quests and regular brushes) and you will need to start over again. 4. If you still experience the problems, you can contact our support team [support (at)idreams.pl] and ask to refund the application. During last few days there was a problem with the login to Facebook. It has been resolved so the login process should work perfectly well right now. I click on premium button and it takes me to the brushes store, but when I click on the brushes I want to purchase nothing happens. how can I buy brushes if nothing happens? I clicked on the premium thing.. it brings up the different brush packs or whatever.. then I click on one, I click Buy & it says Error. Item already owned. But the brushes dont show up in my brush sets. How do I get the ones that I already purchased?? To restore your purchases, please go to options menu (upper right icon in the main menu) and tap on "restore" icon. If you are using the same account then your purchased items should be restored within seconds. I am having problems with the pottery game not showing up in Facebook settings on my iPhone. I uninstalled facebook as the instructions said. After reinstalling, the game still does not show up in settings. I tried uninstalling the game and reinstalling. Still doesn't show up. Next question: why can't our accomplishments be restored after reinstalling the game? I like the game, but I really don't want to start all over. Unfortunately, it is not possible to get your coins, brushes back as points are stored in your local save file and when your application is removed points are reset to zero. I can't login with facebook although I have followed the instructions. Still, after 3 years, I cannot get onto Facebook from my Amazon Fire with this app and what is really annoying is even on the newest Amazon Fire I got this year, it does not list this game in my devices. Spent a lot of money on this app and it was a waste of money. Very sad as this was expensive with the extra purchases of brushes and colors that ought to have been included and there is no help or updates at all. Seems to me that Idreams got the money and ran. Unfortunatelly we do not support "Let's Create! Pottery" on Amazon anymore and you probably have the old version that was available there. We do support Google Play and iTunes. I'm really sorry for inconvenience.